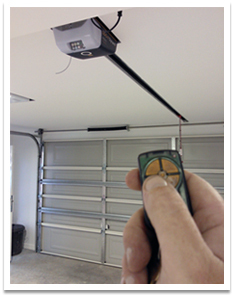 Does pushing a button sound better than unlocking and opening your garage door in the rain? Most garage doors new and old can be automated easily, providing the door is in reasonable working order and you have power in your garage. We supply and install quality B&D automatic garage door operators, which provides convenience, security and safety to your door. All new automatic operators are supplied with 2 new key ring remotes and a fixed remote inside your garage with the option of more remotes, keypads or key switches. Your door may already be automated with an older chain driven operator that makes a lot of noise, you might like to think about replacing it with a new, smooth and quiet belt driven operator. We also stock remote controls for a wide range of makes and models of automatic operators.